I think the best phrase to describe De La Soul's place in the history of rap music is "dead end." I don't mean for this to have negative connotations; rather, it seems to me that the group represents a road not taken, a history of rap that Might Have Been had the genre not evolved in a different direction. This sort of thing is interesting to consider when looking at music history. Back in 1989, De La Soul was hailed as the next big thing, the future of rap, the group that was going to change everything and usher in a new age. And, while they haven't been failures by any means, the rise of gangster rap in the nineties means that the group's role has been relegated to an interesting historical sideshow, rather than an important force in the narrative of the music. But in a way, that makes De La Soul (and other similar dead end groups) more compelling. You've never heard anything like it before, because no one has followed in their footsteps. They were the first and the last group to capitalize on this kind of rap, and their lack of successors serve to make them all the more unique. De La Soul's debut album 3 Feet High and Rising is hailed as their magnum opus, and critics in 1989 wrote how it was "radically unlike any rap album you or anybody else has ever heard" and represented the future of rap. When this future failed to materialize, De La Soul's subsequent releases spent a lot of time and energy coping with this unfulfilled prophecy. De La Soul is Dead is an acerbic critique of the gaudiness of gangster rap, and on Buhloone Mindstate, the group complains about their role as the dark horses of the rap world. Perhaps the critics' predictions did put too much pressure on De La Soul - the group's later releases seem to be struggling to both live up to the hype and exercise the massive influence that was anticipated. The problem is, though the critics can have their own picks about who should represent the future of any given discipline, popularity and success rarely correspond to what the critics would like. I'm sure there's an alternate universe somewhere where De La Soul is considered the most influential group in rap; in this world, we'll just have to accept them as a unique footnote to rap history. WHAT I KNEW BEFORE: I actually saw De La Soul in concert once, back in 2007. (They performed for about two minutes before the event was called on account of rain). But I wasn't aware of their significance in rap history until I started reading about popular music last year, which prompted me to listen to 3 Feet High and Rising in December of 2008. I hadn't touched the group again until this week. MY LISTENING: I listened to 3 Feet High and Rising (1989) once every day this week. I also listened to De La Soul is Dead (1991) and Buhloone Mindstate (1993) twice each, and The Grind Date (2004) once. WHAT I LIKED: De La Soul's first two albums were released before the landmark case Grand Upright Music, Ltd. vs. Warner Bros. Records Inc., in which the judge ruled that one must obtain legal permission for each and every musical sample used in a piece of music. As a result, De La Soul was free to use all sorts of samples in these two albums with little threat of legal retribution. Aided by producer Prince Paul (who pretty much functions as the fourth member of the group for their first few albums), De La Soul is very good at crafting together snappy beats to rhyme to. Rapping over guitar riffs, brass fanfares, and all sorts of other music, the trio imbues their music a warmth and vivacity that a lot of rap lacks, I think. This innovative use of sampling allows De La Soul's music to be more emotive than most rap music, especially rap music from this time period. 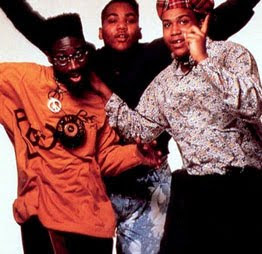 Whereas Public Enemy was blasting out songs with righteous anger in 1989, De La Soul was far more laid-back. Songs like "Ghetto Thang" still decry the living situation of inner-city African-Americans, but their constant references to the "Daisy Age", optimistic songs like "Tread Water" and feel-good tracks like "The Magic Number" means that De La Soul's social criticism comes through a completely different kind of music. They're not just laid-back hippies, though (in fact, they would grow to resent their hippie reputation). Their sophomore album contains "Millie Pulled a Pistol on Santa", a chilling song about violence and child abuse. But De La Soul also has a good sense of humor, as seen through the large number of short, playful tracks on each of their albums. Whether they're rapping over a French education tape in "Transmitting Live From Mars", dropping light-hearted insults in "A Little Bit of Soap", describing themselves in couplets in "Description" or rapping over lounge piano music in "Johnny's Dead", these short tracks are far from filler. Rather, they serve to supply the unique personality of the albums, and in some ways are far more effective at this than the actual full-length songs. De La Soul's second and third albums, De La Soul is Dead, and Buhloone Mindstate, tackle the issue of the group's place in the world of rap in interesting ways. As an example: De La Soul is Dead features skits scattered across the record. In these skits, children listen to De La Soul and making fun of the group, throwing the tape into the trash at the end of the album to leave and "go listen to Hammer." These conceits are clever, and they give music critics something to write about. But this self-reflection doesn't add a lot to the album musically; the skits are too numerous and break the flow of the album. There are similarly annoying skits on 3 Feet High and Rising and Buhloone Mindstate- while De La Soul is great at the short, 60-second track, these short, 60-second skits never work out as well, and range from mildly interesting to blatantly self-indulgent. I'm not asking De La Soul to make a tighter album (part of the group's appeal is their long, ambitious projects), but most of the skits are unnecessary, and the message more effective when incorporated into the music. Finally, De La Soul is not nearly as entertaining once new sampling laws were in place and the group couldn't just glean riffs from whatever they wanted. Buhloone Mindstate is considered by some of the group's devotees as their finest album, but, for me, it lacks the playful beats of the first two records, and while the raps are competent, they just don't have the personality of the group's earlier stuff (though, unlike their other albums, Buhloone Mindstate does contain some great jazzy tracks, like the beautiful "I Be Blowin' "). After De La Soul stopped collaborating with Prince Paul, their staleness is even more apparent - The Grind Date is a fine record, but it lacks the punch that the group carried during their heyday. WHAT I LEARNED: It was interesting to explore the world of early 90s alternative rap. I was expecting the music to sound dated, but De La Soul still seems like a breath of fresh air when compared to most rap - probably because we haven't been exposed to derivatives and knock-offs for the past twenty years. FURTHER EXPLORATION WOULD ENTAIL: My lack of rap knowledge means that I'm not quite sure where to go. Is Pharcyde similar to De La Soul? Should I listen to Prince Paul's solo stuff? BEST SONG YOU'VE HEARD: "Me, Myself and I"
BEST SONG YOU HAVEN'T HEARD: "Tread Water", which is actually a pretty stupid song (De La Soul are on record saying that they hate it), but for some reason has been stuck in my head all week.